The Delta Riggs have converted national audiences to their explosive live set with a no-holds-barred attitude, performing recently at Big Day Out, Pyramid Rock, Festival Of The Sun, and Peats Ridge Festival, and opening for the likes of Primal Scream, The Jim Jones Revue, and Divine Fits. 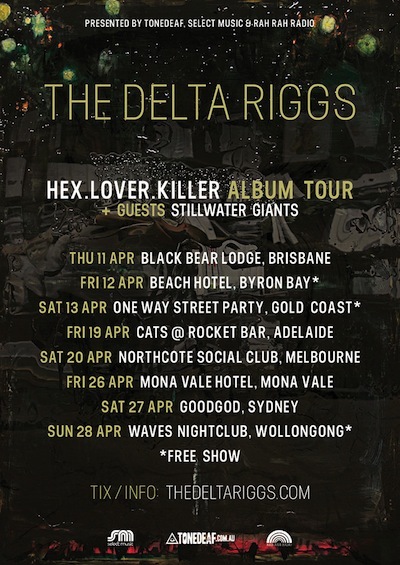 The forthcoming tour will see The Delta Riggs in their prime as one of the country’s most enticing touring acts, as they share wares from their new album for the first time, including new single, Rah Rah Radio. The Delta Riggs have self-produced their debut album to craft a unique combination of their dark psychedelia, hostile punk and innovative blues.